Adis says:I like how this looks like a celebrity autograph. 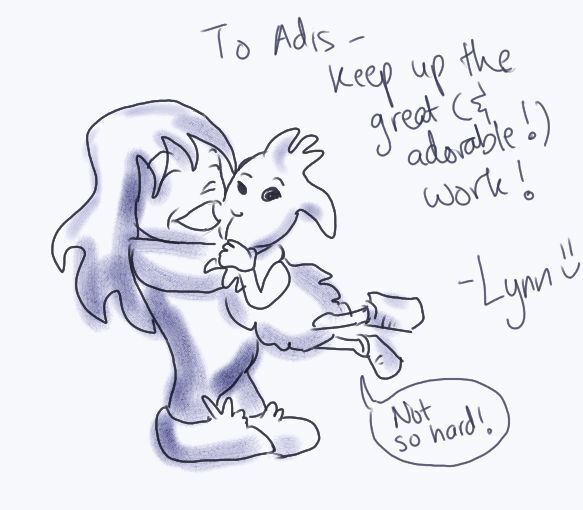 It was drawn by Lynn, author of Sand and Stone, and much more than just a webcomic artist!. I just love it when fellow artistic types like CYS. By the way, we've been getting lots of new readers this week, so to all of you, welcome! On Tuesdays and Thursdays I post fanart from readers, and should any of you wish to send some my way, please feel free to do so! Also, for the new readers, on Tuesdays and Thursdays I post a new No Room For Magic strip, sometime about noon. (That's my other comic. It's different from CYS, and a lot of fun. Really, it is.) Got it? See you there!